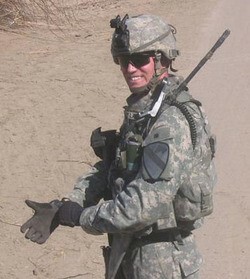 Army Staff Sergeant Paul M. Latourney, 28, of Roselle, Illinois was assigned to the 2nd Battalion, 5th Cavalry Regiment, 1st Brigade Combat Team, 1st Cavalry Division, Fort Hood, Texas. He was serving as a cavalry scout in Baghdad under Operation Iraqi Freedom. On March 2, 2007, SSG Latourney and another soldier were killed when an improvised explosive device detonated near their vehicle while they were on combat patrol. Growing up on military bases, Paul Latourney learned to speak four languages and never doubted that one day, he’d be a soldier. By the time he graduated from Lake Park High School, he’d already survived boot camp and joined the Army reserves. “He was a very good kid,” said Andy Livingston, Latourney’s high school German teacher. “a quiet kid, but strong in character.” SSG Latourney was out all the time doing patrols – night and day. He knew the risk. “That’s real bravery – when you know the risks, control the fear and do what you’ve got to do. There wasn’t a more noble person. He had the biggest heart you could imagine,” Latourney’s father said. SSG Latourney’s son is the recipient of a Folds of Honor Children’s Fund Scholarship.